Location does count in helping you sleep soundly at night. Choose a very windy or rainy spot to set your tent and you may have trouble keeping yourself warm no matter how much cloth you put on. Remember to avoid exposed areas and low areas like valleys or areas facing uphill. Places with trees or walls will shield you from wind and rain. To fight off the cold, you need enough calories to generate energy and heat in your body. Don’t worry if you are on a diet: a day of two eating lots of calories will do you no harm. Have big, hearty meals and snacks to keep your body ready for the cold. Staying hydrated is so very important, though you should not drink too much or you may end up going to the toilet at several times at night. Having some hot drink or even some hot water will be very handy. In the winder, you can even boil snow to get water. Doing some physical exercise is one of the best ways to warm up yours body. You can go for a walk or do some jogging…you will find your body temperature raise quickly. Remember to do some warm-up exercises before going to bed. Wear suitable clothes is actually the best way to not get cold. Don’t go to bed when you are freezing or it may take at least a while for you to feel warm again. Also, don’t wear wet, sweat clothes to bed. You need to stay dry no matter what so a change of dry, clean clothes is necessary. When packing for your camping trip, you need to be prepared to sudden change in weather. It is essential to prepare an extra pair of socks and a change of clothes, just in case. To stay warm, you need to several thin layers of clothing: it is more effective than just a very thick layer of pajama and also helps avoid overheating. Choose moisture-wicking fabric like wool, silk synthetic materials and stay away from cotton at all cost because it absorbs moisture quickly. Thermal underwear is highly recommended. Don’t wear clothes that are too tight. The most common sleeping accessory during camping trip is a sleeping bag. 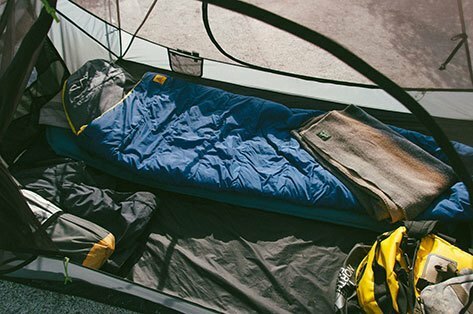 A sleeping bag rated for zero degrees will prove very effective to keep you warm. Inside the sleeping bag, you can use a sleeping pad or sleeping bag liner to raise the temperature: they are highly affordable, handy, and easy to wash.
For good insulation between you and the cold ground, it is advised that you have at least one base layer to raise your bed off the floor (in fact, the more layers the better). For the base, you can use air mattresses, rugs or even thick blanket. Without a layer underneath the sleeping bag, you lose heat directly to the ground. Before you go into the sleeping bag, fluff it up to make sure that the fibers are not flat. While sleeping in the bag, try to keep your nose and mouth outside the bag. 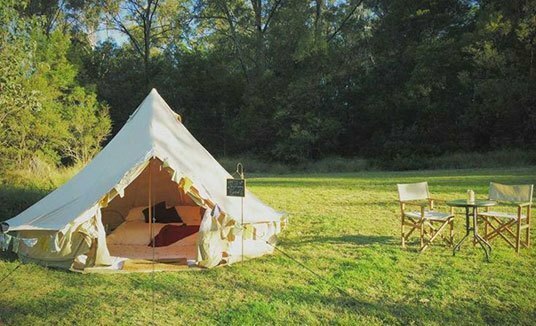 You should also ensure adequate ventilation (by keeping tent vents open) to avoid condensation due to body heath and breath. This applies if campfires are allowed in the camp site. Make sure the fire is away from the tent and flammable items and don’t leave it unattended. Before you go to sleep, extinguish fire completely. Beside warm clothes and sleeping accessories, you have various heat options to keep you warm and comfortable during the night. Using heated rocks is the probably the most inexpensive option. You can heat them up with the campfire easily. Putting hot water bottle in the sleeping bag is also very effective. Next, you can choose portable hand warmers and self-heating gel packs. They are widely available at very low prices. For cold months, it is advised that you bring along an electric heater to the campsite (of course, you will need batteries as well). Using a portable gas heater can warm up your tent very quickly, even during winter days. When using such devices, it is very important to use your common sense and follow safety advices from the manufacturers. For example: using fuel burning appliances in a poorly or un-ventilated area like inside the tent is very dangerous. You need to take the risk of carbon monoxide poisoning seriously. This applies for camping stove also. You should never leave them unattended: who knows what sort of incident may occur, especially with children nearby. Don’t let them run overnight too: remember to switch these devices off before you go to bed. It is best to let them run for a while before bed time and a little bit when you first wake up in the morning. If possible, you can use a thermal blanket too. They help you enjoy the heat from the heater much better. Having at least one person to sleep with will help you stay warm better. A merry tent with two-three people sleeping together is much less likely to be cold. For cold nights, a tent will fare better than a hammock if you pitch it safely. Who knows, if you sleep on a hammock, you may wake up next morning on the ground. It is essential to waterproof the tent or rainwater can get in and make you feel really miserable.